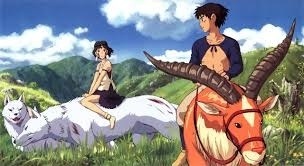 Today, I thought I would highlight one of my husband’s favorite Hayao Miyazaki animated films, Princess Mononoke, per his request. 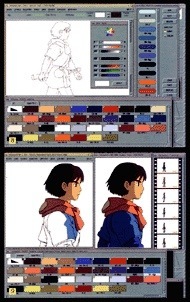 This animated film was released in 1997 in Japan and adapted for English speaking audiences and distributed by Disney. Set in medieval Japan, Miyazaki’s original story envisions a struggle between nature and man. The march of technology, embodied in the dark iron forges of the ambitious Tatara clan, threatens the natural forces explicit in the benevolent Great God of the Forest and the wide-eyed, spectral spirits he protects. When Ashitaka, a young warrior from a remote, and endangered, village clan, kills a ravenous, boar-like monster, he discovers the beast is in fact an infectious “demon god,” transformed by human anger. 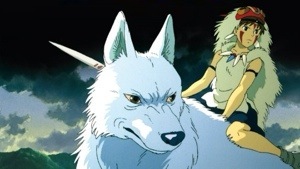 Ashitaka’s quest to solve the beast’s fatal curse brings him into the midst of human political intrigues as well as the more crucial battle between man and nature. 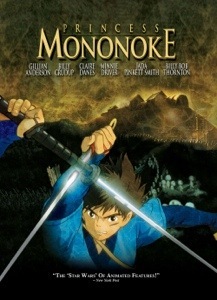 What I find the most interesting about this film is not only is an epic fantasy story, with interesting characters and scenery, but it also seamlessly integrates hand-drawn cels with computer-generated images, which created a new standard of visual storytelling.